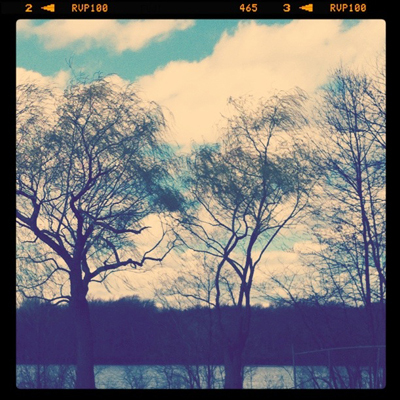 To finish up the month of Small (can you believe it's the end of April? 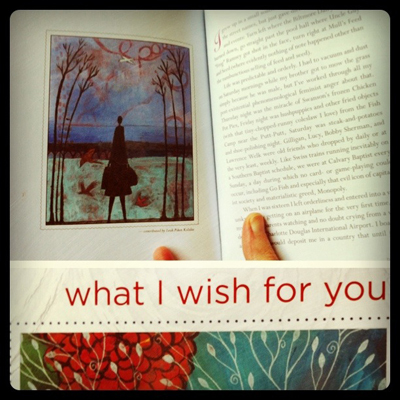 ), I thought it'd be nice to take some time to reflect on all the small things we're grateful for. It can be so easy to get caught up in the things that stress us out, bring us down, frustrate, or sadden us. But there's always much to be grateful for, even if those things are very small. I took a long walk yesterday, moving slowly, but oh so grateful for the movement, the gorgeous day, and the colorful scenery. One of my favorite things is flowering trees that bloom in Spring and my neighborhood is currently filled with them, all so beautiful that it makes me giddy. 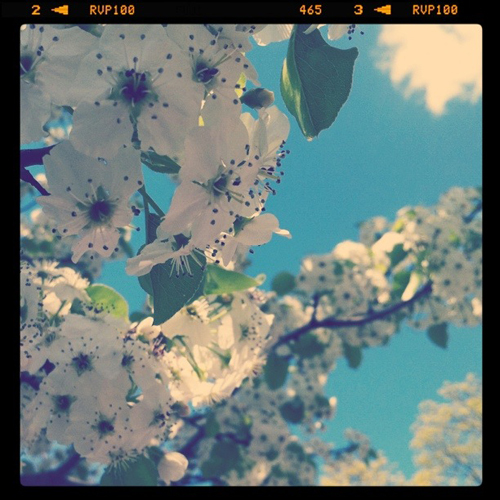 So right there, are several small things I'm grateful for: mobility, a long walk, gorgeous weather, beautiful flowering trees, and taking pictures with my iphone. Some other things I'm feeling grateful for today are my sweet husband, soft kitty paws, the white noise of the air purifier, ice water, and Alba pineapple quench lip balm. So tell me, what are 5 small things you're grateful for today? There are still a few tiny touches to put into the nursery, but I couldn't wait any longer to share this little room that I've been working so hard to create. I'm in love with it (it's definitely my favorite room in the house!) 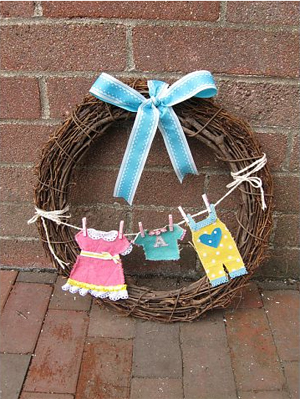 and hope our little girl will love it too. I've shared where I got some of these items at the bottom of this post, just in case anyone is curious. 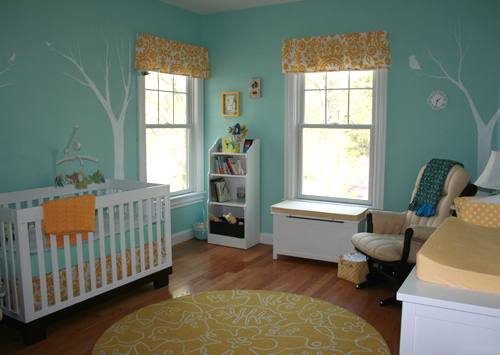 At first I was thinking of doing a yellow and gray nursery, but the hubster didn't think it was feminine enough, so I went with aqua and yellow. 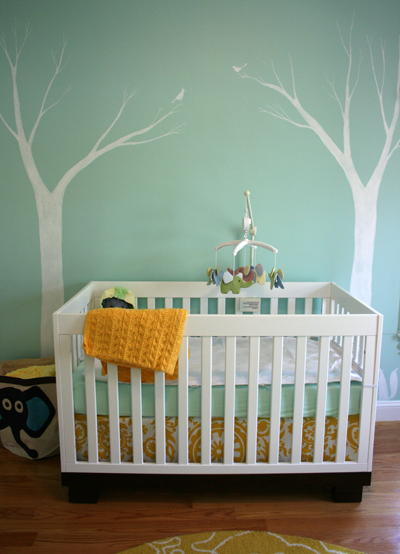 Looking around for inspiration, I saw a gorgeous nursery that used the Robin's Nest paint color with yellow and happened to have a very similar crib to the one we bought! 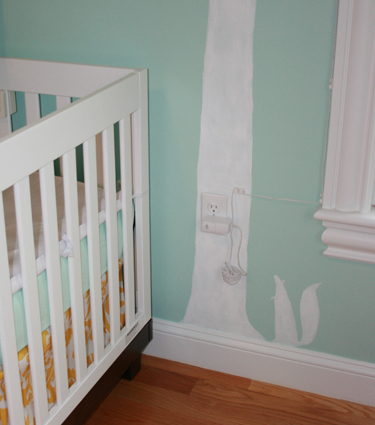 So we started with the crib and wall color and went from there. I loved adding all the personal touches along the way. Customizing and hand-creating items really made the space magical for me. I sewed the crib skirt and curtains out of fabric I found online and painted the sweet, simple wall mural of trees, each with its own bird and/or woodland creature. 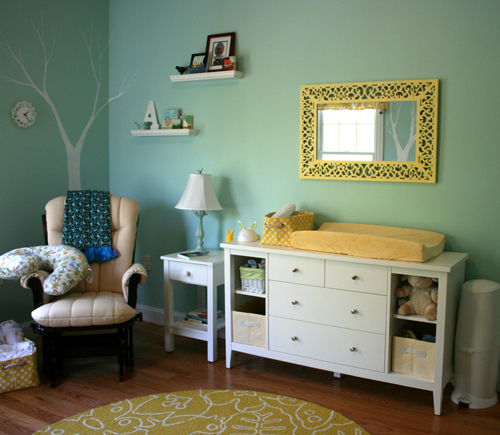 I enjoyed customizing items, like the mirror and lamp, which I painted to match the nursery. I also loved adding hand-crafted items from loved ones, like the quilt hanging over the chair, created by my talented cousin, Kim. 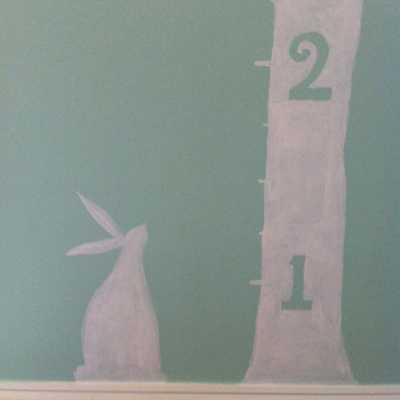 Looking to put something in the space to the right of the dresser, I combined the idea of the hubster (to paint another tree) and my best friend (to hang a growth chart), and painted a growth chart tree with a little bunny rabbit. I love how it came out. 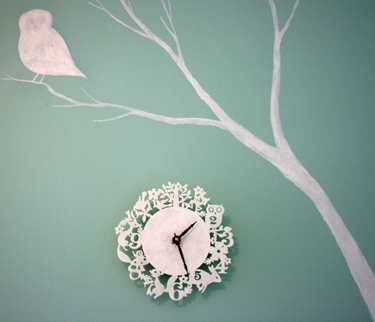 I'm planning to use white cut-out leaves (or birds or butterflies) made of contact paper, to mark her growth on the wall. I fell in love with this clock from Decoylab early on (they make the coolest clocks! 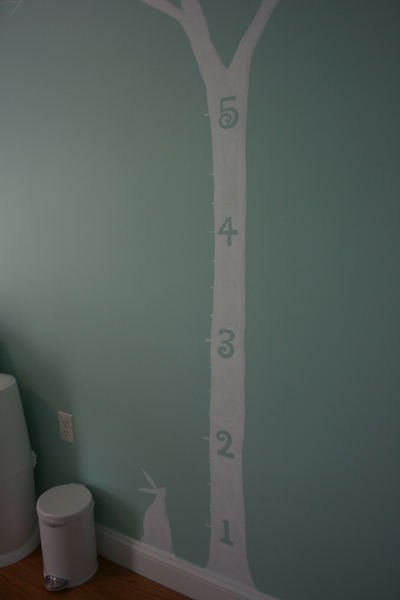 ), but it was a bit translucent and looked off-white on the wall. So I painted it white to make it opaque. Perfect!! I love how it also looks a bit like a round moon on the wall. 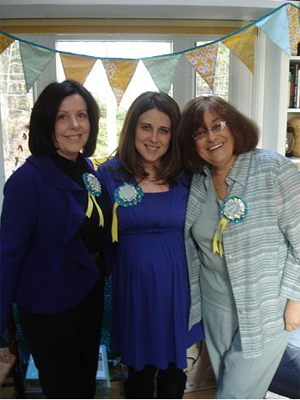 This clothesline was hand-crafted by my best friend for my baby shower. Isn't it adorable? I love the little "A." Here are some close-ups of the lamp. 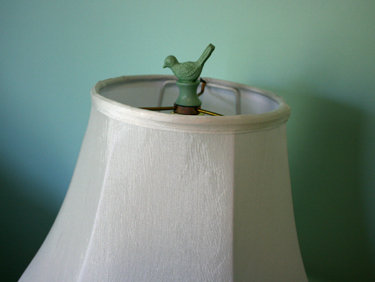 It fit so perfectly with with the little birdies and was easy to customize with some paint and a white lampshade. 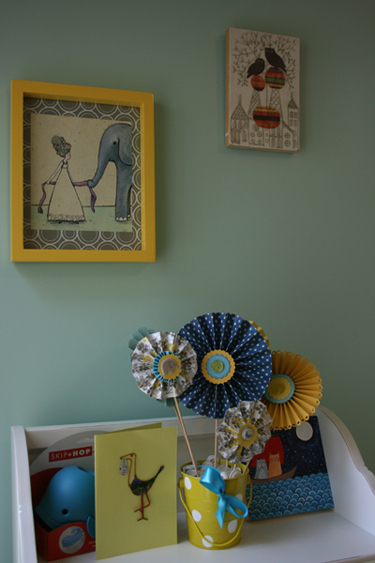 It was fun combining items and art, my own (like "Lucy and the Elephant" and "Owl and the Pussycat" paintings) and that of others (like the Amy Ruppel encaustic above, and the polka dot bucket full of fans from Judean), that I already had in my possession, to decorate the room. I'm sure I'll be adding/subtracting and changing things up over time on the shelves. And I had to share the little squirrel because he's a bit hidden, but so sweet. 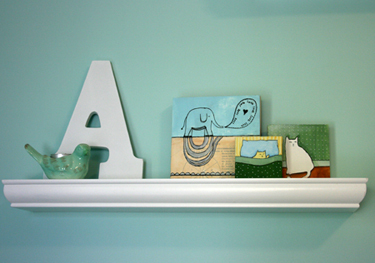 I hope you enjoyed the peek into my baby girls' nursery! 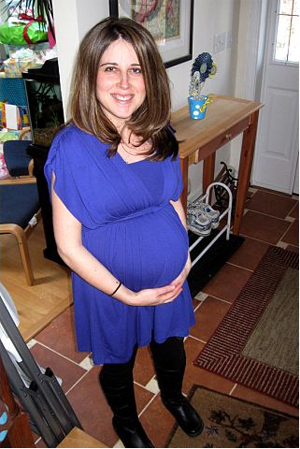 We've got less than 2 weeks til my due date, so we'll soon be adding the best part: her! 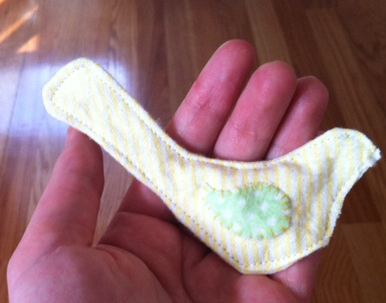 Crib: Babyletto Modo crib from Amazon. 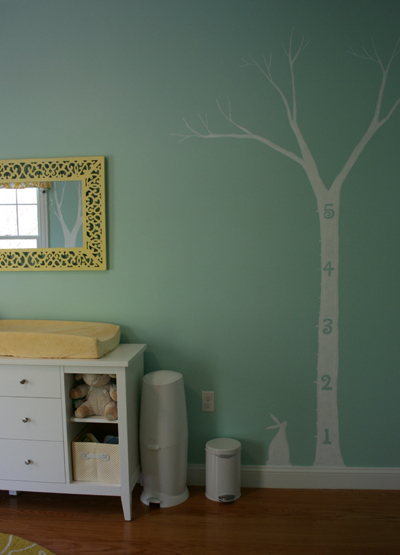 Wall mural of trees, woodland creatures, and growth chart: Hand painted with acrylic. Curtains and Crib skirt: I made these myself with Premier Prints Suzani fabric in corn yellow from fabricguru.com. I used a slightly modified version of the Young House Love no-sew tutorial to create the crib skirt. I did sew the hem of the skirt, but I used her (brilliant) velcro idea for the top. There are blackout honeycomb shades hidden behind the valances. 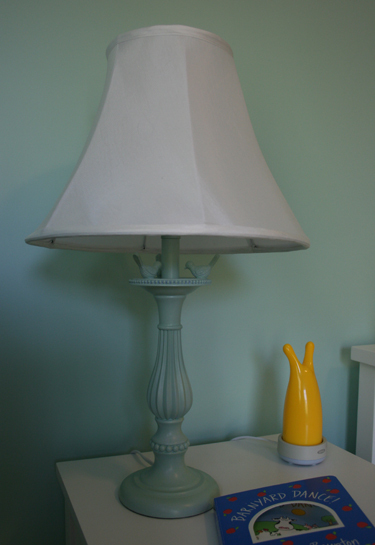 Mirror and lamp: I purchased both at Home Goods and painted them to match the nursery. I changed the lamp shade to a simple white one. Nightlight: Oxo "Tooli." The hubster and I love this thing. It's super cute. Baskets/buckets: The ones in and on the dresser (except for the small white one, which was a gift), book shelf, and next to glider are from The Container Store. The elephant bin next to the crib was a gift from my dad and step-mother, but I've seen them at Giggle. Wall shelves: Home Depot. Artwork on shelves is by me! I'm not sure where the little bird/votive holders came from. I bought them for myself ages ago. The letter A was also a gift. Mobile: Pottery Barn. I have to say, the mobile is super cute, but the music that went along with it was dreadful. We ended up buying a clearance mobile to change the music box part. Art on top shelf of book shelf and hanging above it: Two paintings by me and "Urban love" encaustic by Amy Ruppel that I've had in my collection for years. 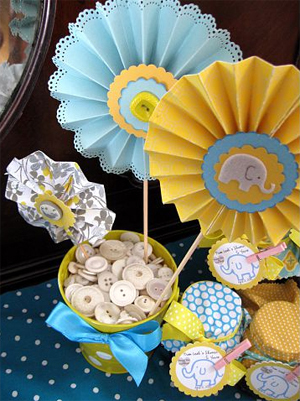 The yellow polka dot bucket and adorable fans were created by my best friend as baby shower decorations. I had to take some home with me! 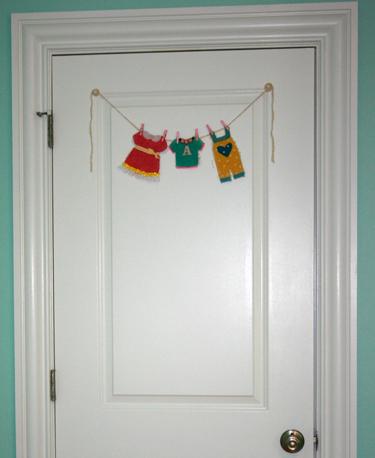 Clothesline (on the back of the door): Also by my best friend, Judean as part of a baby shower decoration. She hand-dyed the clothes and constructed them, which totally blew me away! Any other questions, ask away! 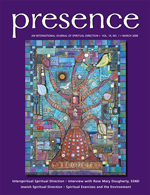 When Leah set “small” as the inspiration for April I smiled to myself at the synchronicity this theme had with my present project and approach to creative living. This past few years chronic illness has necessitated I slow down and approach everything I do, from creativity to rehabilitation, in small chunks. 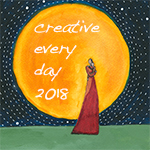 I know that creative activity helps nourish my wellbeing but sometimes when I’m feeling ill, tired or pushed for time I need to be gently nudged into action. One of my favourite ways to do this is to use short timed creative prompts. Small time chunks, between ten or twenty minutes, usually work best for me. I’ve used many prompts I’ve found in books or learnt on courses but for a long time I’ve enjoyed making my own mini exercises up and sharing them in groups/workshops I attend or run. * Ten to twenty minutes is manageable even during difficult times. * They’re not overwhelming in their expectations or length and so meet less resistance from my tired mind than a larger project might. * Often they inspire further creative output and ideas. My main rule when approaching a timed challenge is to have no expectations for the results. I give myself permission to make a huge incoherent mess and remind myself that the resulting creation is not to be judged. Taking off any pressure to create a huge project and allowing freedom from our inner critic seems to open the imagination up; having shed the weight of expectation it seems to fly. 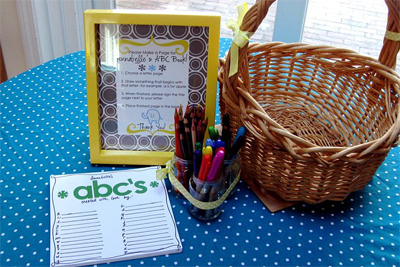 I now create and email weekly prompts suitable for inspiring a variety of creative mediums, named TIC TOCCs. I also write a Tuesday post on my Wright Story blog where I hope people may be able to discuss (and if they wish link to) their TIC TOCC experiences. On this post I also share my own art and writing results. 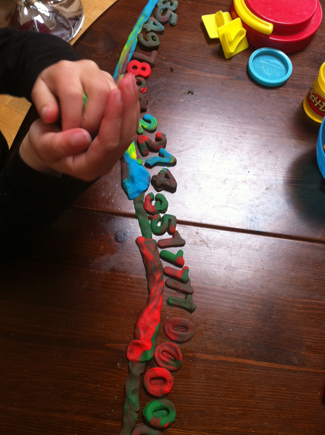 You can read more about TIC TOCC, what the anagram stands for and how to sign up here. 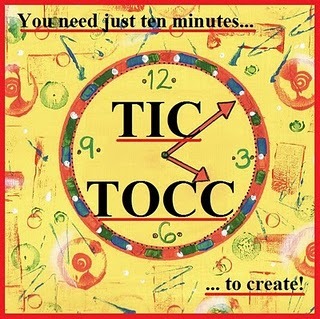 I hope that people receiving my TIC TOCC prompts are encouraged that, no matter how tired or pushed for time they are, it’s possible to set a timer and create for just ten or twenty minutes. It would be lovely to share my TIC TOCC journey by sharing experiences with others. Some of my favourite ideas have come from doing these timed exercises and the ‘high’ I get from giving free reign to my imagination is wonderful. Even small bursts of creativity can do us the world of good and often great things grow from small. 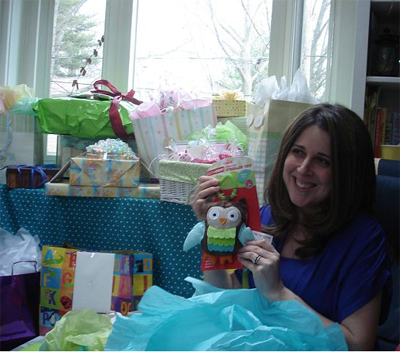 Thank you Leah for inviting me to do this guest post on your constantly inspiring Creative Everyday Blog! Sitting out on the front porch this weekend, I wanted to play with some ideas, but also wanted to grab what was close at hand (going up and down stairs is not my favorite thing at the moment! hehe.) I had a sparkly pen and a pad of post-its, normally used for grocery lists, within easy reach. Perfect! While enjoying the sun, birds, and warm Spring air, I quickly went through a series of post-its drawing out some ideas that were in my head. Post-its are so non-intimidating and they fill quickly. I feel no attachment to them and therefore no worry about wasting them or making something good on them. 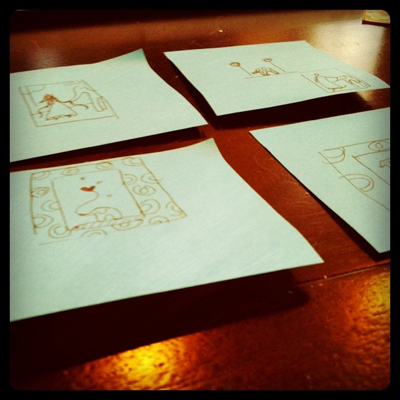 They are a pure play space to draw on fun florescent paper that I can then spread out in little grids to look at later. Perfect for the small theme. Every tried doodling on small bits of paper? Does it help free you up? Give it a try! At the end of each month I will announce the totally optional theme for the following month. 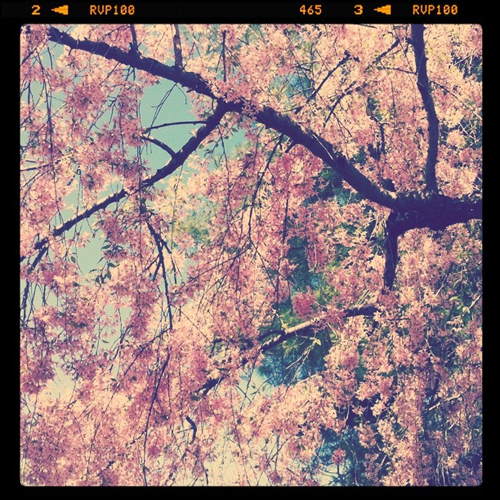 For the month of April 2011, the theme will be Small. 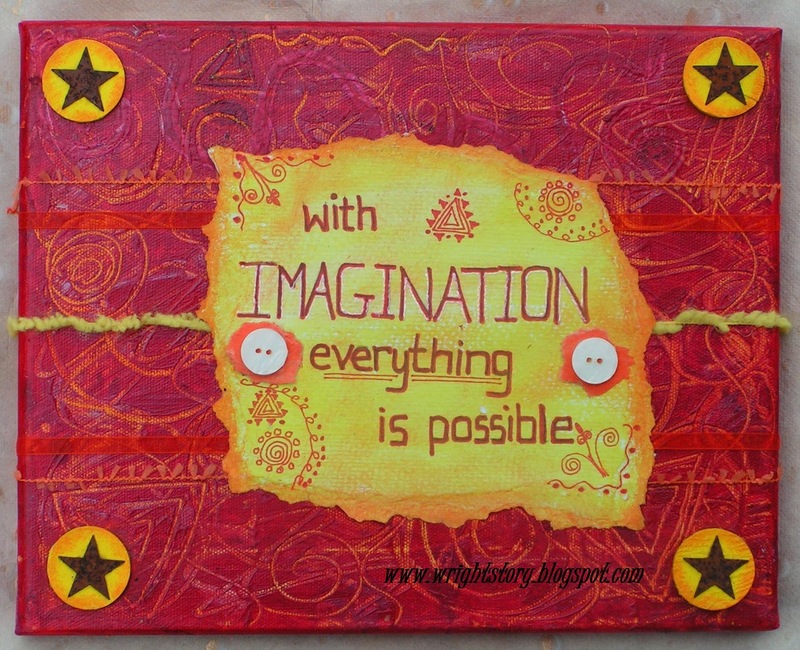 As always, this month's theme for the Creative Every Day Challenge is totally optional. Use it if it inspires you, continue being creative every day in your own way if it doesn't, or do something in between. 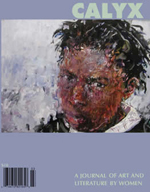 You can sign up for the 2011 Creative Every Day Challenge anytime. More info can be found here and the sign-up page is here. 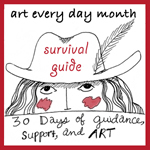 *Fill a page with thirty 1" squares and fill one each day with drawing, paint, words, whatever! *Take your camera outside and focus on the little things around you. *Make a list of the small things you are grateful for in your life. *Write about what it was like to be small. 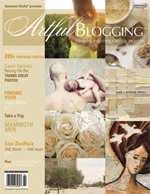 *Work with your favorite medium in a small format. How small can you get? 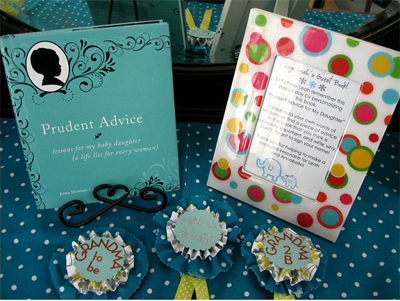 *Make a series of tiny paper airplanes, small boxes, or miniature charms. *Make or buy a mini sketchbook. Use a page to record each day. *Make a view finder to look at your world in a new way. 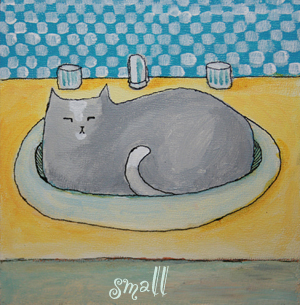 *Eat a meal of small things...finger sandwiches, tiny tarts, small sips. Savor every bite. *The art above is modified from one of my Itty Bitty Kitty art pieces.